Welcome to the Toole's Garage Inaugural Car Care Clinic page! On October 25th from 10 am to 11:30 am we will be hosting a NO CHARGE fun event. The purpose of the clinic is to empower individuals to have the confidence in their abilities to find and work with auto repair shops. 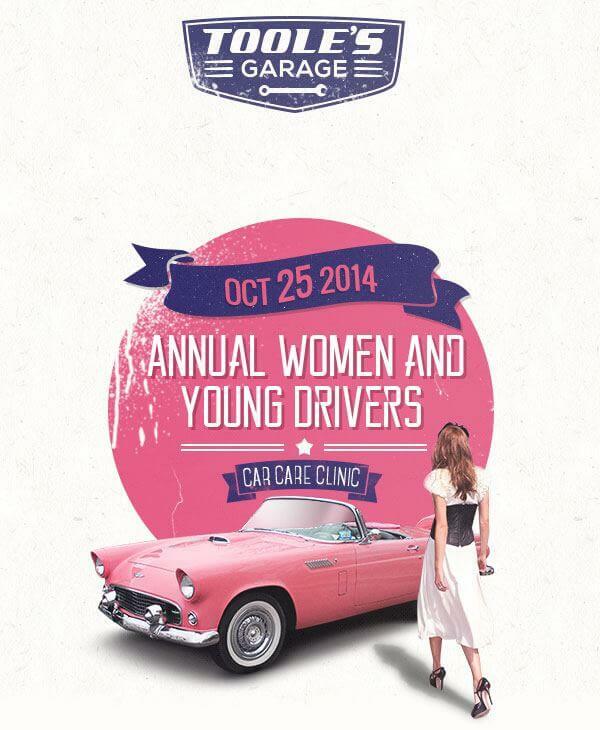 This event is geared towards women, as October is Breast Cancer Awareness Month as well. Moms and Dads, your young drivers can benefit from this as well. We will be teaching some of the fundamentals of car maintenance and auto repair shop 101. There will be some HANDS ON stuff that we encourage your to perform if you are interested. Everything will be very clean for you, but for those that WANT to get dirty, we will have some stuff for that too! It should be informative and fun, after all, that is what Toole's Garage is all about anyway! There will be pastries and beverages and some gifts and raffles. SPACE IS LIMITED, so please RSVP below so we can make sure you are well taken care of! I know we have many RSVP's already! We look forward to seeing you and hope you have a blast!